I know this much, most of Wealthy Affiliate members are in violation of the FTC Affiliate Disclosure law. How do I know? Well, because I look at some websites and the affiliate statement template in the site content. They do not meet the requirement of the FTC. Why is this important? Well, you can lose all your hard earned money if a customer file a complaint with the FTC. Especially when your business successful, you are the most vulnerable to consumer complaints due to the volume of your business. Am I trying to create trouble? NO, I did not create the laws. As a Lawyer, I share with you the right way to comply with the laws. I am not enforcing the laws either. It is up to you to decide what you want. So please, I am posting this in response to some private emails asking for direction on this issue. THIS IS NOT A LEGAL ADVICES. I AM ONLY SHEARING MY OPINION AND EXPERIENES. YOU SHOULD CONSULT AN ATTORNEY OF YOUR CHOICE REGARDING THIS SUBJECT. How to meet the FTC Affiliate Disclosure Requirement? This rule applies to any websites that receive benefits from third party. No matter how small the benefit, if you receive anything you must disclose. It must be placed in a way the customer can see clearly, and It must state (Affiliate Disclosure). Create an Affiliate Disclosure webpage by itself, nothing else. The template in the Wealthy Affiliate is insufficient, because is only addressed Amazon affiliate and products. I know some people in here also promote Wealthy Affiliate, you must disclose this. I recommend you use a blanket Affiliate Disclosure statement. This cover everything. You can get one at http://disclosurepolicy.org. It is very easy to generate one specifically for your business. It is free. This is where you add the links to the disclosure on your website. Add one in the Footnote with the link text (AFFILIATE DISCLOSURE). Remember, the Footnote must appear on every page and post. Add one more link to the top, either on the menu or on top of the sidebar widget. Remember, your sidebar must appear on every page and post. Here is an example: This website places the disclosure on top of the right sidebar widget. That is, it! Very simple. 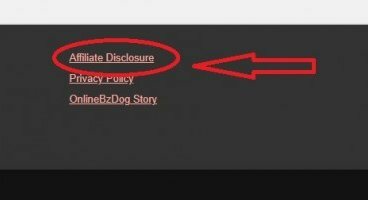 Display your affiliate disclosure with confidence. 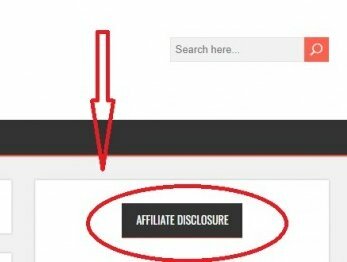 From my experiences, the disclosure of the affiliate statement on the website has ZERO effect on the business. On the other, A Business stands to lose everything for failure to comply with the FTC rule of Affiliate Disclosure. I hope my post answer some of your questions. This is not the only way to do it. Be creative and be proud. Just remember, you must clearly place the text: Affiliate Disclosure Statement. I look to hear from you all. Have a wonderful weekend. This is no longer current. You must have a disclosure on each page, not a link to a single disclosure page. I just did a webinar on this with a former FTC lawyer. You are saying that we all have to add a few more 100 words on each page. I have not noticed any changes on the big publishers. What about the publishers with 1000 of pages? I have to check this with someone that I know at FTC. If this is true, it will be a daunting task for most publishers. Make sure you have it in place for all the new posts. You can add it to old posts along the way. That will show an acceptable pattern to the FTC of compliance. Hi, Jeannine is it possible to provide an example of what we need on each post? I have the affiliate disclosure in my menu, but we need to have a disclaimer within each post as well? Is it sufficient to have something like this before any affiliate links in a post? Yes I wondered about it first because I was not promoting Amazon...this is very helpful. I will research further...for peace of mind. Though sure we will need to do a refresh periodically in case of changes. Great post. I have seen websites as well not disclosing enough. They have a menu item that says Affiliate Disclosure in the footnotes. I'd love to know what your thoughts are with the new GDPR legislation for the EU. I haven't spent too much time with GDPR legislation. I'll have to get back with you on this. thx for the idea. I did modify the text in the default disclosure provided by Wealthy Affiliate because I do not have affiliation with Amazon. I am happy you are giving the link to DisclosurePolicy.org. I will make changes and ensure my site conforms to FTC requirements. Thanks for this very informative post. I have that affiliate disclosure on each post as a page. Just added a disclosure to all my videos that promote a product. Hopefully, I have done enough. Something new every month. Sir, you did well. You did more than the FTC guideline. I just want to share with you this, do not worry too much about it. The rule is design to protect the honest business owners from dishonest one. I can tell you this, your customers will value your advice more than the competitors because you are honest. They trust you. This is why most businesses that proudly display the disclosure actually see an increase in business activities.